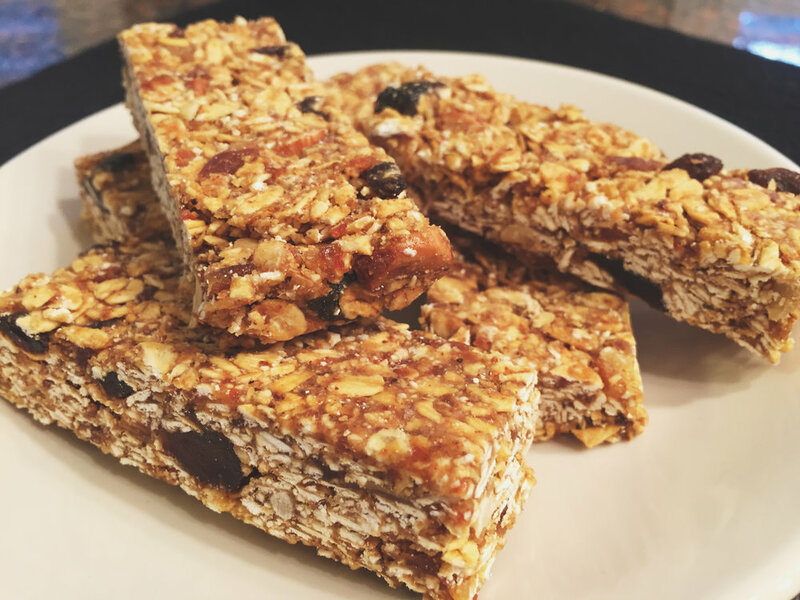 Say NO to processed granola, power and protein bars and YES to these EZ to make, tasty and satisfying bars. Made with real ingredients, these bars are sure to delight as a on-the-breakfast, snack or sweet treat! ~optional additions: cocoa nibs, dried organic fruit, nuts, banana chips, vanilla, cinnamon, etc. Blend dates in a food processor until forms a dough-like consistency – no more than a minute, can be rolled into a soft ball. Recommended, optional step: Toast oats, include nuts if raw, in a 350-degree oven for 10-15 minutes or until slightly golden brown. If preferred, oats/nuts can be used untoasted. In large (roomy) mixing bowl, place oats, almonds and dates. Use small sauce pan, using low heat, stir honey and nut butter until warm. Pour mixture over oats/almonds/dates and then mix well, so the dates are dispersed throughout. Once completely mixed, transfer mixture to an 8x8-inch baking dish or other small pan lined with parchment paper – this way, the bars are easy to lift out. Press down firmly until uniformly flattened – use a smooth drinking glass, to roll over entire mixture for even depth and well packed bars. This will help hold them together better too. Place in freezer (or fridge) for 10 – 15 minutes to firm up. Remove entire pan of bars and cut into bars, makes 10 or if prefer squares, will make 9. Store in an airtight container; good for up to a week. Can keep in freezer for extra freshness (and won’t eat all in a week); one bar defrosts in 10 minutes or less. *If your dates don't feel sticky and moist, before blending in food processor, you can soak them in water for 10 minutes. Drain them and process as instructed. This can help them both blend better and hold the bars together better. This is not ideal, best is to find fresh, sticky moist dates.